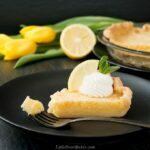 This creamy and refreshing lemon pie uses the whole entire lemon (not just the juice and zest) which gives it an ultra lemony flavor. It’s super easy to make and has the perfect balance of sweet and tart. Preheat oven to 350F. Set aside a 9″ pie plate. Trim the ends off the lemon and cut into thin slices. Remove seeds. Add the lemon slices, butter, sugar, eggs, and vanilla extract into a blender or food processor. Blend until smooth. Roll out and place your pie crust on your pie plate. Crimp the edges as desired and pour in the filling mixture. Bake for 35-40 minutes, or until the top starts to turn golden and the center is set. You may need to cover the edges of the pie crust with foil if it starts to brown before the pie is done. Let cool completely before slicing. Best served chilled. Select small to medium lemons. Large lemons usually have a thicker pith (the white part under the peel) which can make your pie bitter. The pie is delicious as is, but you can serve it with a dusting of powdered sugar or if you want to get fancy, serve with some whipped cream and lemon wedges for a pretty presentation. Best served chilled. Leftovers can be covered and stored in the fridge for up to 5 days.